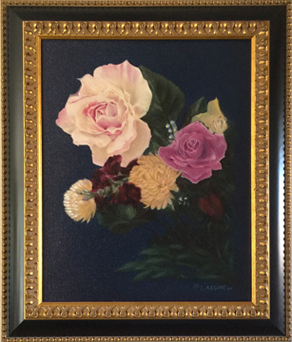 Since there is only one original it gives me great pleasure to be able create ,”Flowers in Paradise” black/gold frame as a beautiful Archival Digital Fine Art of the original that I hand layered with oil paint and then sprayed with an Archival gloss spray that will protect the art. The canvas is shiny which gives a slightly oriental feel. The frame is a shiny black frame with ornate gold design that enhances the flowers. This one of a kind work of art measures 16 ¾” X 20”. I only have this one unique piece and it is the only one I created with this shiny canvas and frame. It also includes its own Certificate of Authenticity. It is incredible in person! After visiting a client from Ocala Florida much to my surprise I found an Equestrian Jumping Competition in progress. Awestruck by the horses, the riders, magnificence of the grounds I noticed at the end of the course, the last fence, was a triple high pristine white jumping fence decorated at the side posts with the most opulent gorgeous flowers. I was captured by the beautiful combination and had to create the pastel painting “Flowers in Paradise”. The original “Flowers in Paradise was so beautiful that I knew creating this Archival Digital Fine Art of “Flowers in Paradise” Black/Gold Frame on canvas would also be another beautiful unique one of a kind work of art. Flowers in Paradise” Black/Gold frame Archival Digital Fine Art stretched shiny canvas gives this one of a kind art an oriental feel. Hand layering the canvas with touches of oil color adds a sensuality to the already lovely flowing petals. The black/gold frame brings life and beautifully compliments the 16 3/4″ X 20″ work of art.